I am in possession of a charming and colourful little Victorian Greetings Card published by S Hildesheimer & Co. There is no message on the rear, nor any date, and I would like to find out the approximate date of the item. I found the card beneath an old decaying window board in a property I renovated. Q Any information would be appreciated however small. A Siegmund Hildesheimer & Co were originally based in Manchester, England and by 1881 were also working from London. Trade directory for 1883 lists them as “merchants and manufacturers of gilt mouldings; publishers of oleographs, chromos and Christmas cards”, with premises at 62 Dantzic Street and 63 Miller Street, Manchester as well as 14 & 15 Silk Street, London. 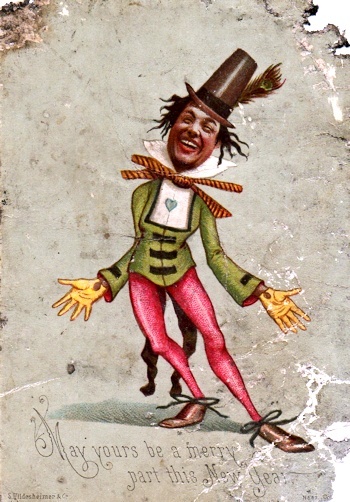 The card would date from the late 1870s to early 1880s. I describe the character on this card as a "zany", they seemed to be a popular theme in this period. 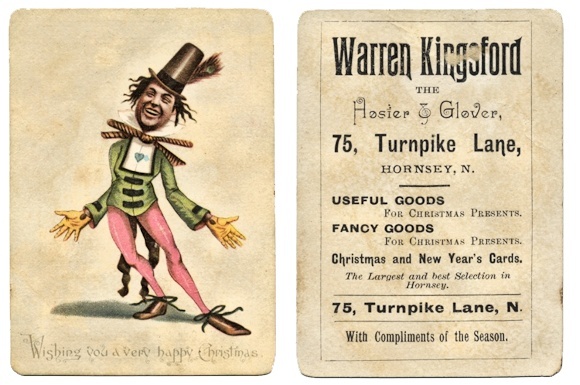 A variant of the same card in my collection has been used as an advertising card for a glover & hosier, their details printed on the reverse of the card.